Chia is also known as- Salvia hispanica, California Chia, California Sage, Chia Pet Seed, and Chia Sage. Most of us do not realize that Chia seed is highly nutritious, has great medicinal properties, and it has been used for centuries in the Incan, Mayan, and Aztec cultures for its beneficial properties. In Mayan "chia" is the word for "strength", and is also referred to as "Indian Running Food" because its energizing capability. It builds endurance because it steadily releases slow-burning glucose into the bloodstream. 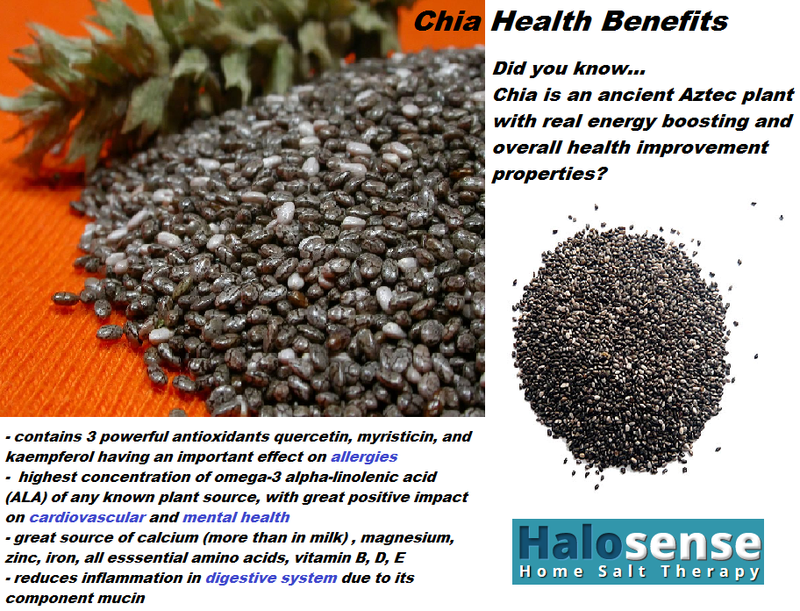 Another exceptional quality of the Chia seed is its hydrophilic properties. It has the ability to absorb more than 12 times its weight in water, providing prolong hydration and anti-inflammatory effect. When you eat chia seeds the body fluids are more efficiently utilized and the electrolyte balance is well-maintained. The powerful antioxidants found in chia seeds, together with the hydratation property help in reducing inflammation and stabilize tissues affected by allergens. People suffering from cystic fibrosis and respiratory allergies may consider introducing chia seeds in their diet due to its mucin hydration effect on the thick and sticky secretions, anti allergic properties and digestive benefits. Chia Seed helps to reduce blood glucose swings and provides support in hypoglycemia and diabetes. As a source of protein, Chia seeds have more digestible protein compared with beans, peas or soy and it is digested and absorbed easily. Because of efficient assimilation, Chia seeds are very effective during periods of rapid growth in children and adolescents or in regeneration of tissue during pregnancy, lactation, muscle tissue for athletes, etc. Chia seeds are also recommended in people with gluten sensitivity, carbohydrate intolerance, Celiac Disease, hypoglycemia or Crohn’s Disease, because chia protein contains no gluten. Chia seed is a great superfood for all people suffering from food allergies or food sensitivities.For weight loss, Chia seeds are also an appetite suppressant but having energizing capability. In Central America and Mexico, chia seeds are mixed in water with lemon or lime juice and brown cane sugar to make a delicious, nutritious beverage known as “chia fresca”. The seeds can be mixed into cerals, yougurt, salads, baked goods or they can be eaten plain. They have a nutty flavor, and can be mixed ground or whole. A respiratory allergy can start with a common stuffy nose and eventually progress in time to coughing and difficult breathing. When visiting a doctor, you will get a series of questions to identify the cause. You would be asked about your exposure and reaction to different allergens, personal and family full medical history to identify allergies that may run in your family and exclude other disorders with similar symptoms. The doctor may ask you to pay close attention for a period of time to possible allergenic factors and reactions. The doctor will choose a testing method, most common an allergic skin test. This is done on allergenic groups, such as : food allergies, insect sting, dust/mites, molds-family, common drugs (penicillin-family antibiotics, etc). A small amount of allergenic substance is scratched on the skin, and after half an hour the doctor looks for a reaction – swelling, itchiness and redness at the site of scratch. That indicates an allergic reaction to the specific allergen scratched on the skin. The doctor may also ask for blood test to look for specific blood markers, such as IgE antibodies associated with allergic reaction. Before the skin test, the doctor may measure the lung functions and repeat this after inhaling an anti-inflammatory drug, to determine the presence of an inflammatory reaction in the respiratory system. The most effective treatment for allergies is to avoid the allergenic triggers. This can be difficult sometimes because some of them cannot be avoided (such as outside mold found all year around in the air) or are not clearly identified. The most common medications for allergies are antihistamines which block the body overreaction to allergens. In severe allergic reactions, anti-inflammatory steroids are usually prescribed and in emergency situations, epinephrine injections (epipen) are used to bring quick relief and restore normal breathing. 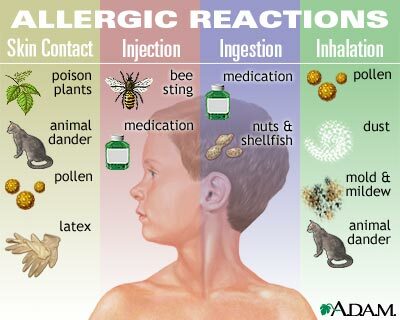 The allergic reactions can manifest as skin allergies, respiratory allergies or even other body general symptoms, such as diarrhea, headaches, etc. Skin allergies are known as atopic dermatitis (eczema) and contact dermatitis. They are treated usually topical, with hydrocortisone or other anti-inflammatory steroid, or sometimes orally. Respiratory allergies can manifest in different ways. Sometimes the symptoms are localized only in the upper respiratory system, mostly nasal passages, but they can progress with time and affect the lung functions as well. Hay fever or allergic rhinitis, when the nasal passages are affected, is usually treated with nasal corticosteroid spray on long term. 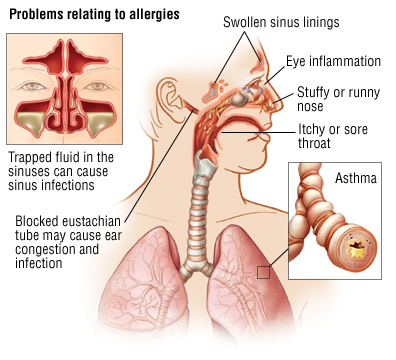 When the lung functions are affected as a result of allergens, allergic asthma is diagnosed. The symptoms here include: coughing, difficult breathing or shortness of breath, low oxygen level in the blood, as a result of allergic inflammation on the respiratory system. Read more here about types of asthma and treatment. For food, insect stings and drug allergies the best treatment is to avoid the food and drugs that cause an allergic reaction. If the reaction is not strong the doctor may prescribe antihistamines or topical creams to relieve the itchiness and slow down the reaction. In severe reactions the doctor will prescribe epinephrine injections to prevent an anaphylactic shock.